I always wanted to celebrate AS’s birthday in a special way but last few years we were never in Sydney to have a lavish birthday party for him. AS’s birthday falls at the end of December and we always have a holiday around that time and so we are away from Sydney. I always feel guilty that I celebrate my birthday with a bunch of friends invited while his last two birthdays were celebrated by just the two of us if we don’t count the random strangers in the restaurant. But this year he had a very special birthday and I am really happy about it. 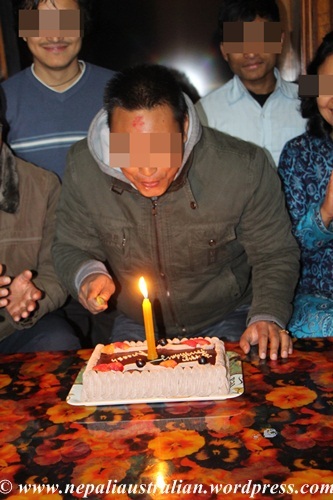 First of all we were in Nepal during his birthday which made it extra special. On 28 December, me and AS went to a restaurant called Transit and celebrated his birthday. It was a special dinner for both of us and we indulge in snacks and pizzas. They had a live band playing some nice classic English songs so we had a great time. 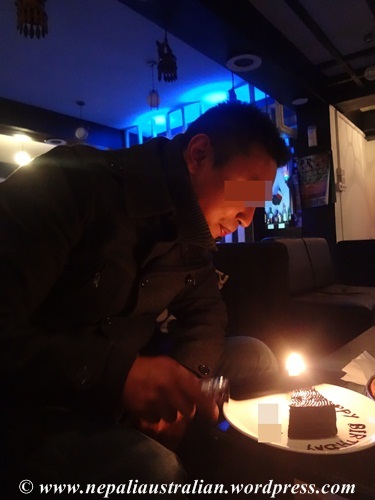 As the owner of the restaurant was someone I knew, I arranged a surprised cake for him and he was really happy. It was just a piece of his favourite double chocolate cake. Also he got complimentary drinks on the house. And that was just a start of his birthday celebrations. As I have mentioned many times before, Nepali calendar is different than English calendar. 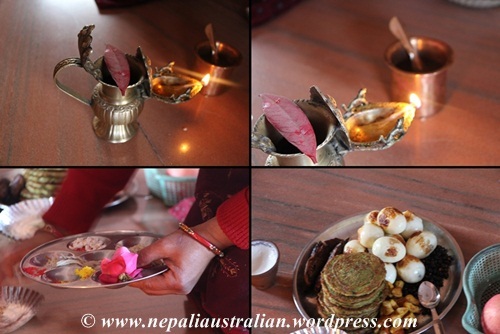 In Nepal, birthdays are not celebrated by date but by teethi (according to position of moon and planets). So he had his teethi birthday again after a week of his birthday as per the English calendar. That day, we celebrated his birthday in the traditional manner. His mum prepared puja and sagun for the birthday. In the morning, he sat down and his mum performed the janmadin (birthday) puja. First gods including Lord Ganesh were worshipped. Then, tika was put on AS’s forehead as blessing. It was followed by sagun (egg, bara, chicken, fish) and gifts from his family. It had been more than a decade since AS got to celebrate his birthday according to Nepali tradition so it was a happy moment for all of us. Then, we went to a restaurant, 8 degrees with his family to enjoy the rest of the evening. The place was not too busy so we enjoyed our time there. The food was flavoursome. It was a great day for AS as he was spoiled with gifts and wishes the whole day. Then the next day, we went out again to celebrate his birthday and this time with my family. 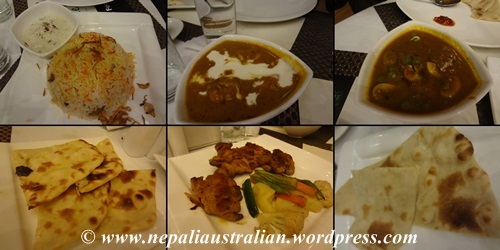 We took my parents, my brother, SIL and little nephew for lunch to celebrate in a Newari restaurant called Falcha. The food was hot and spicy there but all of us were happy to enjoy each other’s company. My nephew enjoyed his outing as well. We had a good time and my parents and my brother also had a gift for him. Overall I am super happy since AS got to have a great birthday in Nepal. I also spoiled him with many gifts and I feel good that he enjoyed his time here in Nepal with our families. I wish him all the best for rest of his life. Love you dear. 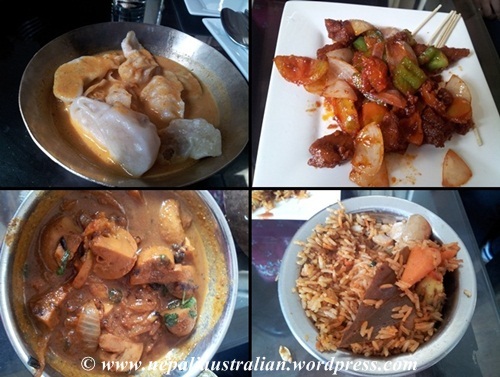 This entry was posted in Family, Nepal, Nepal 2012 / 2013 and tagged birthday celebration, food, Holidays, home, restaurants. Bookmark the permalink. 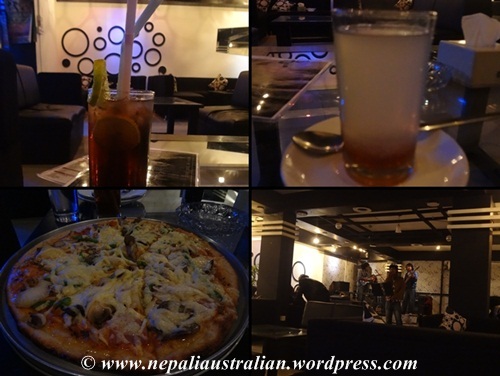 Are all these restaurant in Kathmandu? which one would you recommend? I like the look of transit..
That was really nice. I enjoyed your description of the traditional celebration and the teethi…makes more sense then a set date. Happy Birthday Mr. A. glad to see you both enjoying here.